Need help creating a great event? We've got fundraiser suggestions and a suggested schedule to help you make your fundraiser a success! Car wash, Halloween party, scavenger hunt, tennis tournament, cook off, craft fair, walk-a-thon, bowl-a-thon, anything-a-thon, mini carnival, golf outing, raffle, bake sale, football game, talent show, OR karaoke party, just to name a few! Birthday ($35 for 35 years! ), Mother's Day, wedding, bar/bat mitzvah, anniversary, graduation, quinceañera, holiday, Valentine's Day, shower... Ask for donations in lieu of gifts for anything you celebrate! Contact us with event information! We are here to help. Please contact us with your event details and any questions you have. Depending on what your event entails, begin researching t-shirt companies or other fundraising items. Begin reaching out to local stores and organization members for donations and sponsorships. Start to recruit volunteers. People will support you. All you have to do is ask! Make sure you have a team to help you with outreach and promo! Order shirts or promotional gear. Create Facebook event. Invite friends and organization members to share on social media. Include event details and fundraising goals, along with a link to your More Moments campaign. Create event program if needed. Reiterate donation requirements to donors - list of items, when to be delivered, wrapped, etc. Advertise your event. Pink streamers, posters, etc. Anything to remind them about the event! Continue to promote your event on social media, with posters, flyers, etc. Include event details and breast cancer stats. Contact local news to inform them about your event. Set up table at entrance for donations or info pamphlets. Remind people if they don't have cash or checks they can donate or your More Moments campaign page. Put the (event or raffle) ticket table and posters/promotional materials in central location. Pink out the event location - pink lights, balloons, streamers, etc. Promote your event hashtags, Snapchat filter, etc and encourage people to share their photos on social! 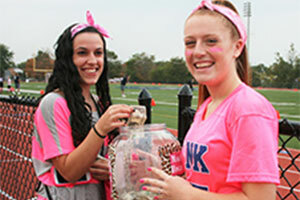 Bring cash to make change for attendees registering on-site the day of the event.